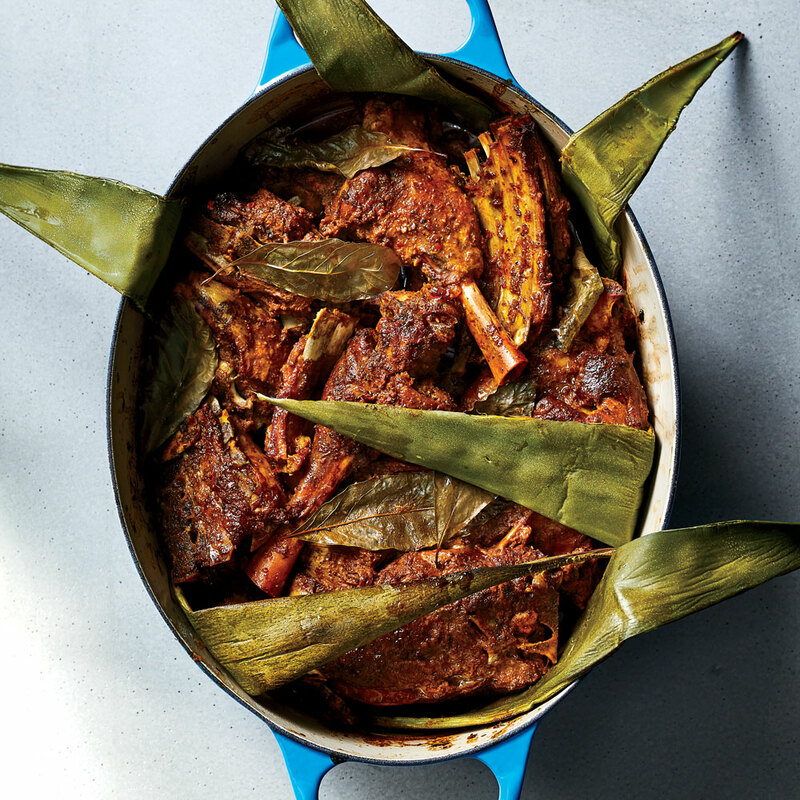 For this dish, chefs Saqib Keval and Norma Listman of Masala y Maíz in Mexico City draw from Indian and Mexican cooking techniques for a one-of-a-kind flavor profile. The restaurant version uses bone-in lamb wrapped in maguey leaves. We found that you can cook the dish in a smaller Dutch oven if you use boneless lamb and omit the leaves—the results are just as spectacular. Fenugreek seeds, available online or at specialty stores, add complexity and a light sweetness to Indian cooking. Make the masala spice blend: Place black cardamom pods, green cardamom pods, cinnamon stick, and star anise in a large skillet. Cook over medium-low, stirring often, 1 minute. Add cumin seeds, coriander seeds, fenugreek seeds, fennel seeds, mustard seeds, and, if using, avocado leaves. Cook, stirring often, until fragrant, about 2 minutes. Transfer spices to a mortar and pestle or spice grinder, and grind until very finely ground. Bring a large saucepan of water to a boil over high. Add tomatoes, dried chiles, garlic, and bay leaves. Boil until chiles are softened, about 10 minutes. Drain, reserving 1/2 cup cooking liquid. Remove and discard bay leaves. Cool to room temperature, about 45 minutes. Stem and seed chiles. While chile mixture cools, heat oil in a large skillet over medium-low. Add onions, turmeric, and ginger; cook, stirring often, until onions are translucent, about 20 minutes. Stir in tamarind puree, vinegar, quince paste, and salt. Cook, stirring occasionally, until flavors meld, about 10 minutes. Remove from heat, and cool slightly, 25 to 30 minutes. Combine onion mixture, masala spice blend, chile mixture, and reserved 1/2 cup cooking liquid in a blender. Process until smooth, about 1 minute. Reserve 1 cup adobo marinade in a small bowl; cover and chill. Place lamb in a large aluminum roasting pan. Rub with salt. Generously coat lamb with remaining unchilled adobo marinade. Cover and chill 8 hours or overnight. Preheat oven to 375°F. Place lamb in a large Dutch oven, and discard any excess marinade in pan. Pour 1 cup reserved adobo marinade over lamb; cover Dutch oven with a large piece of parchment paper, allowing 1 inch to extend over sides. Place lid on Dutch oven, and bake in preheated oven until lamb is tender, about 4 hours and 30 minutes. Transfer lamb to a large bowl. When lamb is cool enough to handle, shred into large pieces; discard bones if present. Pour drippings through a colander set over a bowl; discard solids. Strain fat from drippings, and toss lamb with 2 cups drippings, or more if desired. Serve lamb with tortillas, pickled onions, fresh cilantro, and lime wedges. Review Body: There are no instructions regarding the amount of maguey leaves that are needed for the recipe nor how they should be prepared/included in the dutch oven while cooking the lamb. Could someone update the recipe to include that information, please? Review Body: How many quarts is a "large" dutch oven?